Republican presidential candidate John McCain on Tuesday proposed a $52.5 billion economic plan that would eliminate taxes on unemployment benefits and cut the capital gains tax while warning voters about taking a chance on Democratic rival Barack Obama. "Perhaps never before in history have the American people been asked to risk so much based on so little," McCain told a suburban Philadelphia audience about his opponent. McCain also promised that as president he would order the Treasury Department to guarantee 100 percent of all savings for six months. The Arizona senator, who trails in the polls on economic issues, said, "The moment requires that government act. And as president I intend to act, quickly and decisively." McCain said President Bush's $250 billion plan to buy shares in the nation's leading banks should be short-term and last only until the institutions are reformed and put on a sound footing again. "When that is accomplished," McCain said, "government will relinquish its interest in these private companies. We're going to get the government out of the business of bailouts and equity stakes and back in the business of responsible regulation." "Like the proposals offered by Obama yesterday, these are designed to help ease some of the economic pain being felt by various groups," said CBSNews.com senior political editor Vaughn Ververs. "The problem for McCain is that voters increasingly see Obama as better able to deal with the overall economic situation and piecemeal proposals aren't likely to do anything to alter those perceptions. He has one more chance to make his case in tomorrow night's final presidential debate." 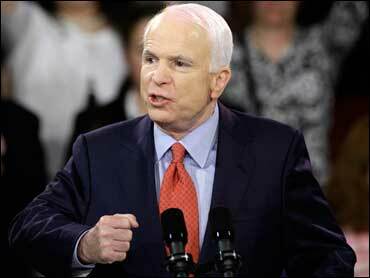 More than 3.6 million Americans received unemployment benefits, according to the McCain campaign. If the government eliminated taxes on unemployment benefits, recipients would see an increase on average of nearly 10 percent, the campaign said. McCain also called for cutting the tax rate on capital gains in half, down to 7.5 percent for two years. "This vital measure will promote buying, raise asset values, help companies and shore up the pension plans for workers and retirees," he said. McCain proposed lowering the tax rate on Individual Retirement Accounts and 401(k) plans to the lowest rate, 10 percent, on the first $50,000 withdrawn. The McCain campaign estimated it would affect 9 million people over the age of 60. "Sen. McCain also shows how little he understands the economy by offering lower capital gains rates in a year in which people don't have an awful lot of capital gains," Obama campaign spokesman Bill Burton responded. "His trickle-down, ideological recipes won't strengthen our economy and grow our middle-class." Burton added that the McCain plan provides "no tax relief at all to 101 million hardworking families, including 97 percent of senior citizens, and it does nothing to cut taxes for small businesses or give them access to credit." Obama's economic plan announced Monday called for suspending the tax on unemployment benefits as well as extending benefits. The Democrat also proposed allowing people to withdraw up to $10,000 from their retirement accounts without any penalty this year and next, a 90-day moratorium on home foreclosures at some banks, and a two-year tax break for businesses that create new jobs. McCain kept up a drumbeat of criticism for Obama's economic plans, particularly his promise to cut taxes for everyone making less than $200,000 a year. Obama "now presents himself as a tax cutter and champion of middle-class America," McCain said, "But he can't turn a record of supporting higher taxes into a credible promise to cut taxes. What he promises today is the opposite of what he has done his entire career." The two candidates unveiled their plans ahead of Wednesday's third and final presidential debate and with just three weeks to Election Day. McCain's proposal comes as Republican campaign veterans say he needs to do more than just criticize Obama in an economic environment that favors Democrats. Recent polling shows Obama with an edge on which candidate can do a better job handling the economy. Obama leads in pre-election polls in enough states to be within reach of the 270 Electoral College votes needed for victory while McCain is being forced to defend Republican turf where polls show the race close. That's partly because of Obama's well-funded onslaught of TV ads and extensive network of field troops registering and canvassing voters; McCain trails on both fronts.